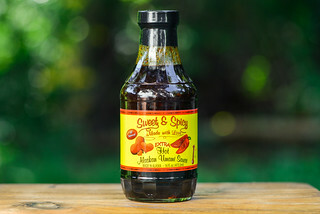 Jacqueline Brooks is the current owner of Southern Belles, but it was her namesake Grandmother who started the sauce tradition in her family. After a trip to California, the elder Jacqueline's husband became enamored with teriyaki sauce—he had never tasted anything like it before in his hometown of Memphis. 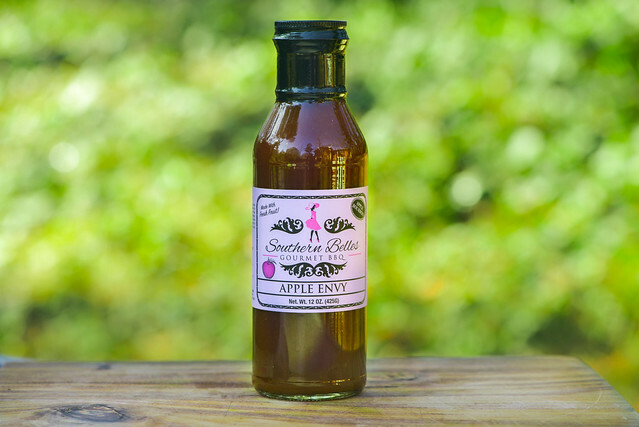 So Jacqueline went on a mission to try to recreate teriyaki sauce at home, and while she never quite got it, in the process, she developed what would later become Southern Belles BBQ Sauce. Jacqueline passed her sauce recipe down to her eldest daughter Miss Vicki, who continued to improve it, and then family member Jacqueline took on the family tradition, expanded the recipes, and began to bottle and sell the sauce commercially. Southern Belles Gourmet BBQ currently boasts eight different sauce varieties and is made in Long Island City, NY. An initial whiff of this sauce imparts a sweet ketchup aroma with a distinct boost in fruitiness from apples. 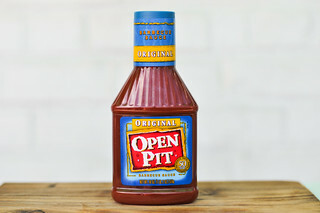 There's more tanginess to the aroma than found in ketchup alone, and that, paired with a light molasses undertone, creates a pretty standard barbecue profile. With a few subsequent nosefuls, background notes of garlic and onion come through, as well as a medium smokiness. This maroon sauce has a glossy sheen and a mostly smooth texture that's broken up just a little by some spices and/or veggies pieces. The sauce is opaque, but you can still see a ton of spices that are black, orange, and red in varying sizes. The sauce has a medium-thick and syrupy consistancy, which causes it to fall first in one large drip off of a suspended spoon, then change to a quick and steady pour. As the sauce slows, the flow switches to slow drips, and after a few of those release, the sauce ceases falling and a medium coating is left clinging to the silverware. The first taste of this sauce is very sweet, but there's a lot of depth to go along with the sugar. First a slightly acidic tomato comes in, followed by a strong apple flavor, giving the sauce a unique taste right off the bat. 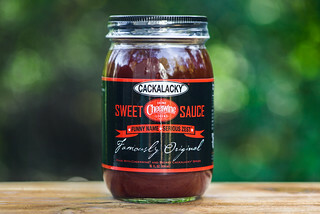 As the sauce settles on the tongue, the sugar both gains more character from molasses as well as becomes balanced by a strong hit of vinegar. Next the spices work their way in and add garlic, onion, and smoky flavors before peppers add an earthy taste and then change over to being spicy. All of these traits persist in the aftertaste, leaving a mouthful of complex, yet balanced, barbecue flavors. The sauce coated the chicken in a medium, uneven layer that baked down well over indirect here. There was some sauce loss over indirect heat, then a little more over direct heat, but the majority of the sauce remained in place and picked up some light caramelization without burning. The flavor tasted pretty on par with what was experienced out of the jar, but cooking the sauce actually gave it an overall brighter character. Combine that with all the well layered flavors already going on and it made for one incredibly tasty piece of barbecue chicken where the sauce complimented, rather than masked, the flavor of the meat. Southern Belles was kind enough to provide me with six different sauces to try out, and this was one of the first I took for a test run and it blew me away. I almost didn't make it my first review though because it appears that, at the time of writing this, Apple Envy isn't available online and I only like to review sauces my readers can buy right away. My desire to get another taste of this sauce won out over practicality though, so I went ahead and gave it a review, and honestly, the sauce was even better than I had originally remembered it as I continued to sample it while writing. 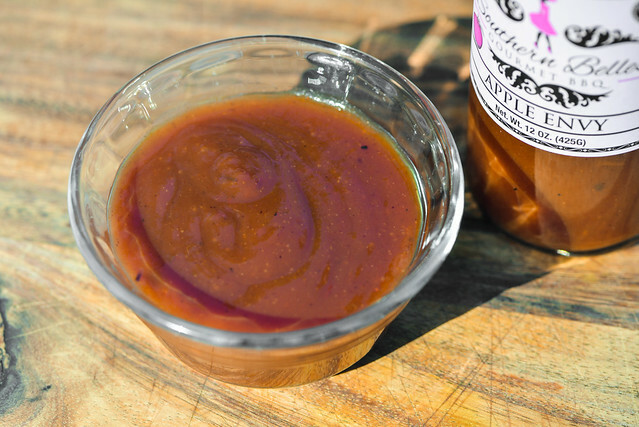 You basically have an extremely well balanced and layered standard barbecue sauce here, delivering all the sweet, tangy, smoky, and spicy flavors you'd expect from the best sauces, but that apple layer makes a world of difference with a flavor that tastes right at home in the overall barbecue profile. I really can't imagine anything this sauce wouldn't do magic on—I'd personally want it on my ribs, chicken, pork, burgers, seafood, veggies, fries....I could keep going, but you get the point. 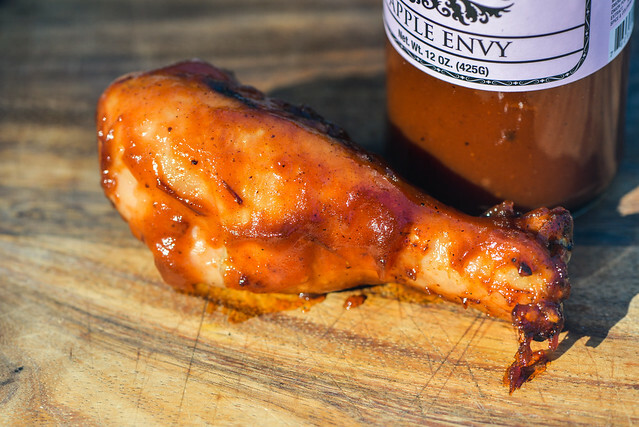 If you're looking for an excellent all purpose sweet and fruity barbecue sauce, look no further than Southern Belles Apple Envy.